Celebrating Carnaval on St. Barths! 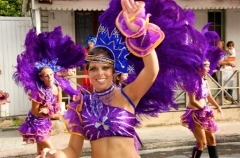 Island music, delicious food, and a festive atmosphere- it must be Carnaval on St. Barths! Music hums in the air and costumed dancers sway in the streets as the city of Gustavia bursts to life with celebration. Children and adults adorned in a variety of costumes come together to celebrate before the start of the solemn Lenten season with one of the Caribbean’s biggest celebrations- Carnaval! The Carnaval celebration began on the 4th with the children’s parade, and pinnacles today with the Mardi Gras celebration in St. Barths’ capital city, Gustavia. Tomorrow, the revelers’ bright costumes will be replaced with garbs of black and white in recognition of Mercredi des Cendres. The spirit of Carnaval, Vaval, will be taken in a procession to Shell Beach and burned, signifying his banishment for the year. If you missed your chance to celebrate this year, plan ahead and book your St. Barths villa and celebrate island-style for Carnaval 2012. Villa WV PRE, perched just above the city of Gustavia, and is a wonderful place to stay; enjoy the party right through the night before returning to this private hillside hideaway. For more St. Barths events, visit WIMCO’s St. Barths Events Page.